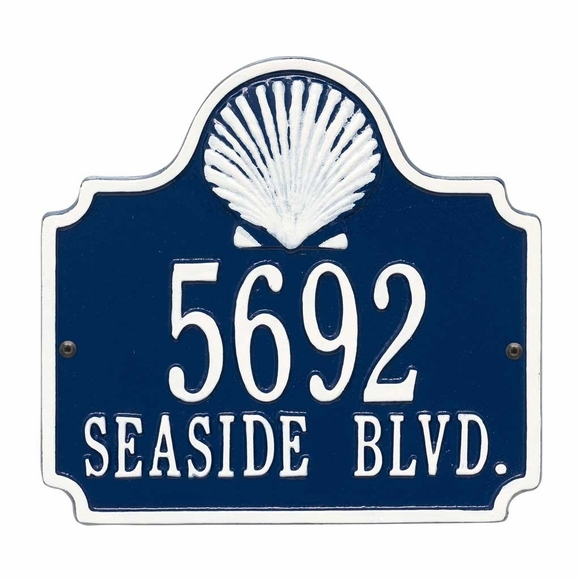 Sea Shell Address Plaque - - wall mount 10.75" x 10" personalized address sign with seashell logo. Made in USA. Holds one or two lines of personalization. The one-line version holds five 3" characters or up to twelve 1.25" characters. The two-line version holds up to five 3" characters on line 1 and up to twelve 1.25" characters (including spaces) on line 2. If you are purchasing a one-line sign, please leave the Line 2 input box empty. Color combinations: BG black plaque with gold characters; DG dark blue plaque with gold characters; OG bronze with gold characters; DW (dark blue with white characters). Beach theme personalized address sign with seashell.